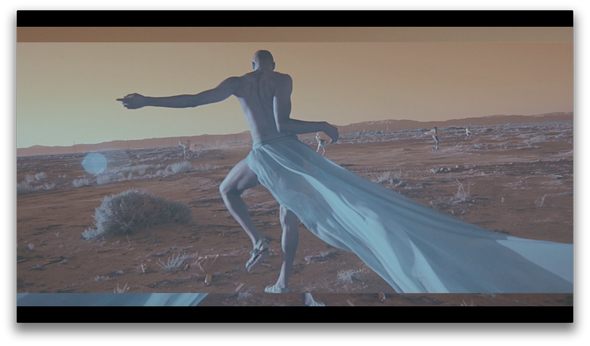 Hercules & Love Affair proudly recently released the latest in a long line of music videos: a tribal, post-apocalyptic vision directed by AlexandLianne with styling from Bernhard Wilhelm and choreography from Josh Johnson, the co-artistic director of 'Sad'. Shot using Infra-red-converted digital cameras – which capture a completely different light spectrum – the film is directed by AlexandLianne, former collaborators with some of the biggest names in music including Kylie Minogue and Tiga, as well as global brands Nike and Mercedes. The inspiration for the video came from Hercules & Love Affair’s founder Andy Butler commenting on the close ties between ballet and dance music. “At the meeting with Defected, the eyes lit up, and I got to write an email to Josh Johnson, my friend at the Forsythe Company inviting him to get involved. Bernhard Willhelm is a fashion designer, possibly known for his love of incorporating absurdity into high end design, who lives and works between Vienna and LA. He’s probably most known in the music industry through infamous collaborations with Bjork, Willhelm has unleashed the full force of his creatively on this project. Starring (amongst others) Josh Johnson – a contemporary dancer and choreographer (for SAD) with the Forsythe Company (formerly the Frankfurt Ballet) run by William Forsythe – the video has been produced by FreeNJOY’s Nathan Scherrer. "Andy makes house a home” says Johnson on working on the project. “He invited us into his house and we stayed in comfort. Rapt in his talents and beats, we started to feel the same and along with Alex, Liane and Bernhard we made something really special”. On ‘Do You Feel The Same?’, the three artistic visions of designer, choreographer, and director have collided to create the most epic Hercules & Love Affair video to date. The single’s release on Defected Records continues the relationship between label and group, following two celebrated Hercules & Love Affair performances at Defected’s Glitterbox residency at Booom Ibiza this summer. 'Do You Feel The Same?' (inc. Extended Club Mix, Purple Disco Machine Remix and Oliver Dollar Remix) is out 08 December digitally, with the vinyl (inc. Todd Terry Remix & Dub and 6th Borough Project Remix) following on 15 December. A full digital iTunes release will drop Feb/March 2015.